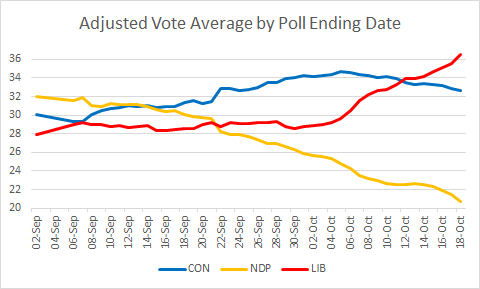 And yet another poll confirms the NDP's meteoric rise, this one by Forum Research. This survey has the NDP vaulting past the Liberals nationally, 25% to 23%. Just like the Liberals, the Conservatives also lose 2 points, to 36%. 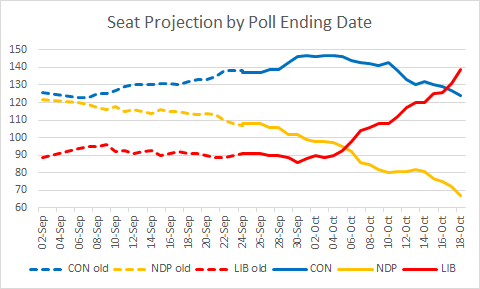 Ominously for Ignatieff, his party falls to 28% in Ontario, 14% behind the Tories, while the NDP rises to 20%. And this poll shows the largest NDP lead yet in Québec: 34% to 25%. The average Conservative national lead is 11.6%. The NDP does not gain any additional projected seats in Québec, but is now within 2% of tripling their seat count to 9. 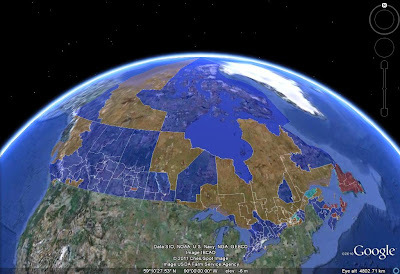 Currently, I have Québec at B 31%, N 25%, C 20%, L 19%. Forum Research states that based on their poll alone, the projected seat count would be 149 C, 71 N, 64 L, 24 B. That PM Layton scenario I described earlier today just got more likely!